Just when it seemed as though Special Stone was set fair to claim the title of Champion three-year-old filly of 2018 by backing up her Korean Oaks win in the Gyeonggi Governor’s Cup at Seoul Racecourse on Sunday afternoon. 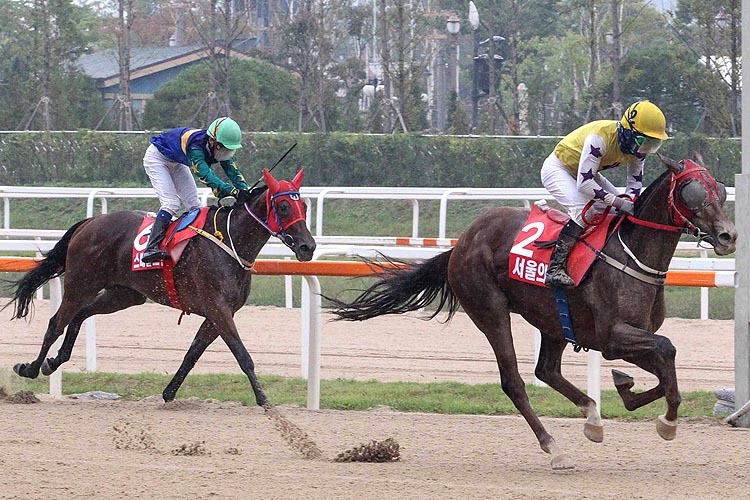 Seouri Byeol had finished similarly quickly in the filly Classic at Busan in July but that day found two too many to pass and had to settle for 2nd as Special Stone dominated. At the top of the stretch this time, Special Stone cruised into the lead as pace-setter and betting favourite Blue Flag started to weaken and under jockey Kim Jeong-jun, seemingly had the race at her mercy. That was reckoning without Seouri Byeol, however. Last with two furlongs to run, Park Eul-woon found a gap and his filly found top gear. Though still trailing with half a furlong to run it was clear she had the momentum and shortly after, she had the race, winning by no fewer than 4 lengths on the line from Special Stone. Nike Street, last in the Oaks, came home 3rd with a tiring Blue Flag 4th. A filly by the Japanese-bred sire, Limitless Bid, Seouri Byeol was wining for just the fourth time on what was her twelfth start. Her colours, those of owner Kim Sun-sik, were last seen in the Stakes race winner’s circle on Final Boss after the 2017 Derby. It was a first big race win for her trainer Kim Dong-chul, a former jockey who gained his license in 2016. For jockey Park, it was his fourth success on a Group race. At Busan, King Of Ace returned to the winner’s circle for the first time in over a year. The American import by Malibu Moon won four of his first five starts in the first half of 2017 before suffering a bad injury. Although he returned at the beginning of this year he hadn’t quit been able to recapture his old form but he looked good when leading gate-to-wire to win the south-coast track’s feature handicap over 7 f.